Jack Frost and Elsa. 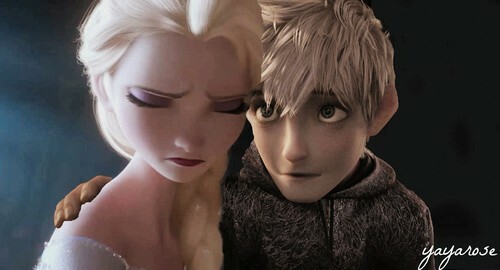 I can only see these two as brother and sister या best friends.. HD Wallpaper and background images in the डिज़्नी क्रॉसोवर club tagged: photo jack frost elsa dreamworks disney crossover. This डिज़्नी क्रॉसोवर photo might contain चित्र, headshot, closeup, हेडशॉट, and क्लोज़अप. Very nice! Though I see them as a couple. OTP! And yes i'm an anti Jackunzel shipper. I'm sorry to disappoint the Jackunzel fans, but it's true. I simply don't ship Jack and Rapunzel.